A multi-purpose probiotic cleaner that’s completely safe to use around children and pets. 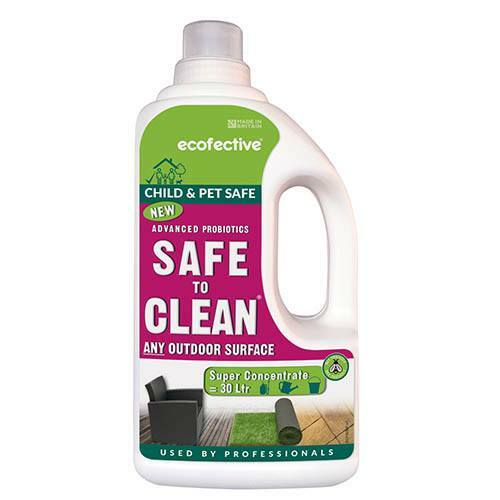 Child, pet and bee safe, ecofective Safe to Clean is a unique, multi-purpose probiotic cleaner suitable for use on any outdoor surface, including artificial turf, wood, concrete, stone, glass and fabrics. Using an advanced formula of surfactants and friendly bacteria it provides long lasting cleaning effects without the use of acids or harsh chemical ingredients. The non-hazardous surfactants provide the initial cleaning effect while the friendly bacteria work by feeding off the dirt. As long as there is dirt for the bacteria to feed from they will multiply and keep feeding to provide long lasting cleaning effect. The formula is super concentrated, with up to 300sq.m coverage and is also safe to be used around children, pets and beneficial insects including bees. Easy to use, simply apply, gently scrub and let the bacteria do all the hard work. Proven to be highly effective, the same formulation is currently used extensively by many professional contractors and venues. Cleaning your patio, paths and garden furniture can have a big impact on your garden's appearance. It will instantly make it look tidier but it’s important to sweep down the area before using Safe to Clean. Make sure your surface is free from leaves or other garden debris before applying the cleaner. Safe to Clean won’t scorch your lawn – making it perfect for paths that run through your garden.